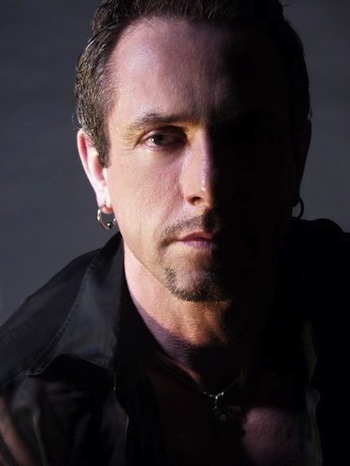 Clive Barker is an openly gay British horror and dark fantasy author responsible for over a dozen novels, several movies, graphic novels, some artwork, and a couple of video games as well. His works almost always feature sexual overtones that are graphic, disturbing, and disgusting in nature. Stories usually involve Another Dimension or many dimensions, though the majority of the story is usually set in a contemporary urban setting. On the Sliding Scale of Idealism Versus Cynicism his stories lie pretty far on the cynical side, with heavily flawed but sympathetic protagonists and an overall dark and gritty tone, though the endings to some of his novels have been happy and magically enchanting, and features themes such as love and redemption. Anyone Can Die - Indeed, in the second novel of Abarat, it seems that Barker can only keep a certain number of characters alive at any given point, so for every new character introduced, another is cleanly hacked away. The Blank - The Engineer in The Hellbound Heart. Blood Bath - Mister B. Gone, the demonic Villain Protagonist from the story of the same name, bathes in a tub full of blood from dead babies. He complains of how difficult it is to keep them alive long enough so the bath would be warm when he empties their blood into the tub. Body Horror - So, so much Body Horror. Deconstruction - The Midnight Meat Train, at least in its film incarnation, is a huge deconstruction of slasher movies. Every single slasher movie trope used or referenced in it is either subverted or justified; the protagonists are responsible adults instead of rowdy teens, the authorities are useless because they're working with the killer, and the supernatural slasher turns out to be upholding an Ancient Conspiracy to keep an Eldritch Abomination out of our world. Doorstopper - Weaveworld, Imajica, The Great and Secret Show, and Everville. There is a scene in the second book of Abarat, in which Leteo asks Christopher Carrion, his master, for an antidote he needs; Carrion makes him beg for it and say all he wants is to serve his master, kicks him around a bit, and then tells him to lay on the ground and open his mouth. Hell Seeker: In the short story "Down Satan! ", a wealthy businessman becomes convinced God doesn't exist, and decides to find out whether the devil does by building a literal Hell on Earth. Humans Are the Real Monsters - Stories combine fantastic and supernatural evil with the evil and cruelties that humans perpetrate against each other. Consider, for example, that the true villains of the novella The Hellbound Heart (basis for the Hellraiser movies) are Frank and Julia, wretched excuses for human beings (Frank even moreso than Julia), not the Cenobites. Magical Land - Most of his novels deal with an alternate reality or more than one realm, which maybe be accessible through paintings, rugs, complex toy boxes or the like. No Accounting for Taste - A lot of marriages have long since gone sour after the couple has been together for many years, whereas romantic relationships where the man and woman have just met will be full of love and the two will struggle against all odds to come together. This isn't always the case, but it's common enough in his stories to be worth mentioning. Also worth mentioning is that an old couple doesn't even need to be officially married to fall apart. In Mister B Gone, the two demons who are described as having a relationship similar to an old married couple end up separating. Nothing Exciting Ever Happens Here - Both The Thief of Always and Abarat open with the child or pre-teen protagonists in towns like these. Abarat begins in a town called Chickentown, for Christ's Sake, where the place's entire purpose seems to be to make Candy Quakenbush miserable. Sealed Evil in a Can - In the Hellraiser movies as well as the novella that they are based upon, The Hellbound Heart the only way the Cenobites will come after you is if you open the puzzle box known as the Lament Configuration. So much so, in fact, that at least in the novella, the Cenobites make and honor a deal with the protagonist (who has accidentally opened the box, and has no idea what it is or does) to spare her if she can lead them to the novella's REAL villain, who has escaped their clutches. Something Blues: Short story Pig Blood Blues. Summoning Artifact: The Lemarchand's Boxes, and especially the Lament Configuration. This page was last edited on 26 December 2016, at 04:43.